Doing more than I currently have been doing is what I have been pushing myself. Because I will be honest there was a point where I was completely burned out. I was burned out to the point where I felt like taking a month off from anything dealing with designing. But you know that I said to myself you’ve come to far to take a break. So I set a specific day to take it easy and not do anything with designing and etc. But I say this to you and its hard for me to take a day off. The reason is because designing is something that I truly enjoy doing. The amount of joy is to the point where I do not feel complete if I am not doing something at least once a day related to design or calligraphy. Do not be fooled this is not something that came overnight. Being honest with yourself in regards to how much you are doing will allow you to do more. When you know truly what people mean when they say working hard is you’ll change your perception of it. For example we are taught working hard is by going to a job and giving it your all. Not saying that is bad and what not but there’s more to it than that. As a freelancer you are working for yourself and doing everything yourself. Such as dealing with clients, knowing what to charge your clients, file management and etc. Then on top of that you will be doing promotion for yourself. We all want to have more in life or some of us are happy where we are. A good quote I heard the past week was ” you cannot have a million dollar mindset with a minimum wage work ethic”. 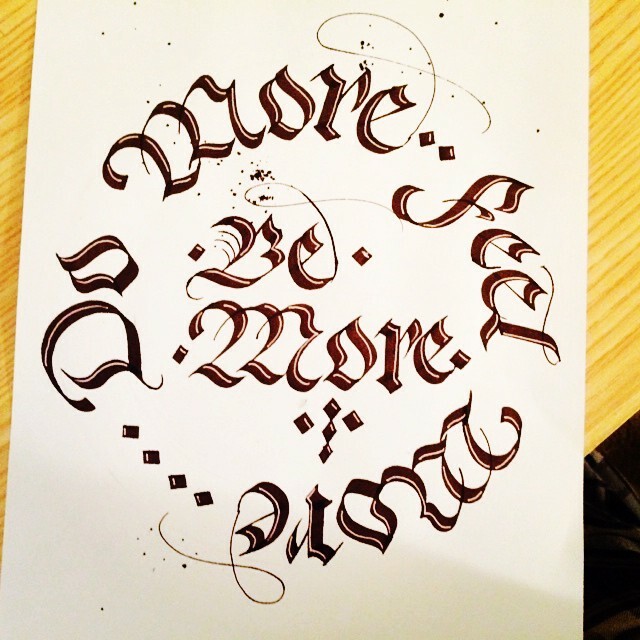 So therefore do more and feel more.